You may recall the running joke in my household: "It might not look good, but it tastes good!" I've long been fascinated with the art of cake decorating, but my attempts have been less than wildly successful. Let's just say that I'm not applying for a job at Charm City Cakes, because you'd hear their laughter all the way at your house. Still, I'm not giving up! So imagine my reaction when my doorbell rang and I found this package on the front step. 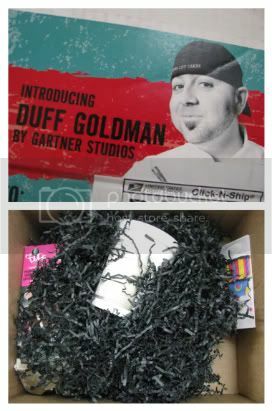 The box contained a sampling of the new Duff Goldman by Gartner Studios line of cake decorating products. I tried the chocolate cake mix and red fondant. I don't often use cake mixes, because we generally get better results when baking from scratch. When I mixed this mix with eggs, water, and oil, I noticed that it looked darker and smelled better than most cake mixes I've tried. The unbaked batter had an aftertaste I didn't care for, but I went ahead and baked it into one 8-inch layer and 9 cupcakes. After the cake was baked and cooled, I made some homemade vanilla buttercream and started playing. I've never worked with fondant before, so I was especially eager to try that. Using the instructions from this book, I shaped my very first fondant rose. I think it turned out okay for a first try. My husband even said, "Wow, you made that?" I made one attempt at covering a cupcake with fondant (it looks so easy on TV! ), but ... maybe next time. Mooseman and I spent some time decorating cupcakes and playing with fondant. Our results aren't exactly masterpieces, but we had So. Much. Fun! We still have plenty of fondant for another day, too. When I sliced open one of the cupcakes, I noticed that the texture was less dense than most scratch cakes and more like a cake baked from a mix. The cake is tender and I liked the flavor: I think it's the best cake-mix cake that I've tasted. Since this was my first time using fondant, I have no basis for comparison. I found that it was very easy to handle, except when I rolled it super-thin and tried to handle the sheets. My kitchen might have been warmer than the ideal temperature, too. I definitely didn't need to soften the fondant in the microwave to make it pliable! 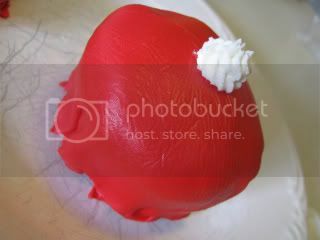 I've read that most fondant doesn't taste very good, and the Duff fondant claims to taste like buttercream. I thought it tasted pretty good! The flavor resembles buttercream, but the texture, of course, is different. (Most of the Duff colored fondants are buttercream flavor, but yellow is lemon-flavored and brown is chocolate-flavored. I haven't tried either of those.) I don't know that I'd want to eat a big chunk of the fondant--like the rose on the center cupcake--but it's not bad at all. With all of the red and white, hearts and roses, it feels like Valentine's Day! But I've found a new hobby, and one that Mooseman and I can do together, so it's all good! The Duff Goldman by Gartner Studios website has some doable cake decorating projects, a handful of very helpful instructional videos (under "Click here to get started with Duff"), and information about where you can purchase Duff products. I'm linking up to Things I Love Thursday! Disclosure: I received these products, at no cost to me, for review purposes. I was not required to write a positive review, and all opinions are my own. I love baking and decorating too! I just bought some mix last week so I can bake some cupcakes and decorate this coming week! :) I have never used fondant,but it is so pretty! I am so jealous! I love Duff and I especially love when he talks up Baltimore on "The Best Thing I Ever Ate" on the Food Network. I used to live in Baltimore and have eaten in many of the restaurants. I just bought some fondant and played with it for the first time in several years. Your rose looks fabulous! that is a fun review. I wish I got some of those! Do you get approached or do they approach you? So fun. I love your rose. Absolutely beautiful and so great you got to spend some time doing something fun together as a family. OK JEALOUS!!!! I so want to decorate cakes that is something I've wanted to take a class on. can you imagine going to CCC and having Duff teach a class. I think I would be to busy talking to everyone ... lol. 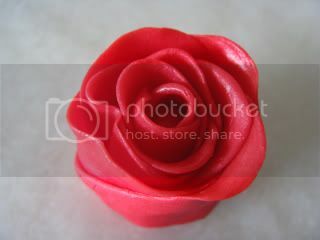 Your first fondant rose looks so attractive.